Stage IIIB non–small cell lung cancer (NSCLC). 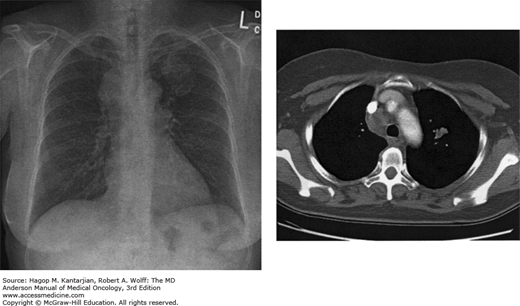 This patient presented with chest pain, and the chest x-ray (left) showed an approximately 4.0- by 3.0-cm mass in the left upper lobe and an additional mass in the right mediastinum. Initial computed tomography (CT) revealed a 4.5-cm mass in the left upper lobe and a 5-cm mass in the paratracheal region. Biopsy confirmed NSCLC. Staging evaluation showed no distant metastatic disease (T2N3M0). The patient was treated with concurrent chemotherapy and radiotherapy. The posttreatment CT (right) showed significant therapeutic response.